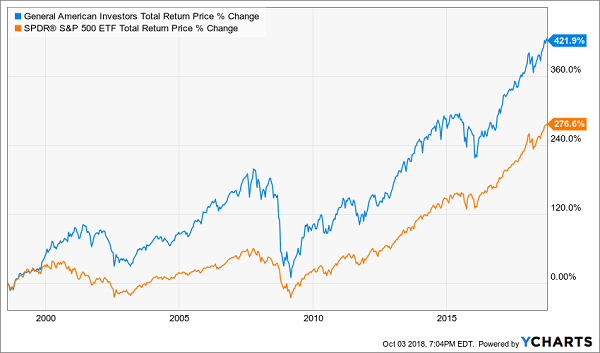 From Contrarian Outlook: If you want to double–or even triple–your dividend income overnight, there’s an easy way to do it: buy stocks that pay special dividends. And today I’ve got 3 totally ignored special-dividend payers for you. Each of these top-notch income plays throws off “hidden” payouts yielding up to 9.7%! We’ll unmask all 3 as we roll through this article. We’ll also look at the almost comical reason why stocks like these get completely overlooked, and I’ll give you everything you need to get in on the next big special payout before it drops. It happens like clockwork: a company announces a blowout quarter or a hike in its regular payout … and rolls out a big special dividend either days before or just after. It’s the ultimate attention getter! Because let’s be honest, there’s no better way to get first-level investors to take notice than by doling out free money. With S&P 500 firms sitting on a $2-trillion hoard, plus billions more in overseas cash headed back to the US due to tax reform, there’s a boatload of extra greenbacks to go around these days. And when a surprise special dividend drops into your account, it can turn a ho-hum payer into an income investor’s dream–like what happened with my first pick. As I wrote in that piece, Duke owns 499 warehouses across 32 states, and Amazon.com (AMZN) is its No. 1 tenant, making Duke a perfect “pick-and-shovel” play on the e-commerce megatrend. Here’s the thing, though: if you go to, say, Yahoo! Finance, you’ll see that DRE’s current dividend yield is 2.9%. That’s not bad, better than the S&P 500 average of 1.7%. But it’s a shadow of DRE’s “true” yield, because the popular stock screeners don’t count special dividends in their yield calculations. 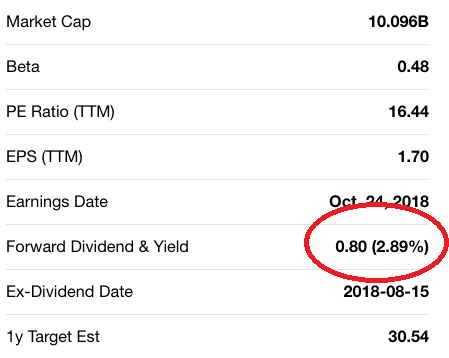 But when you add DRE’s $0.85 special dividend back into its regular payouts, you get its “true” dividend yield of 5.9%! And Duke can easily keep these extra payouts coming: its regular dividend eats up just 52% of its funds from operations (FFO, the best standard of REIT performance), very low for a REIT. Finally, even though Duke goosed its full-year guidance in its Q2 earnings report, the stock boasts a far lower price/FFO ratio than a year ago: a reasonable 20.9 now vs. 23.5 then. 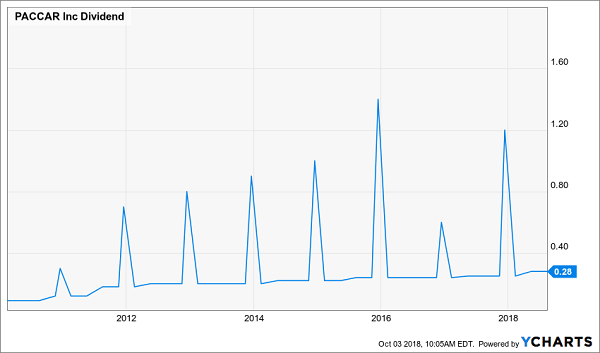 So go ahead and grab a piece of “Amazon’s landlord” before it drops its next special payout and/or big dividend hike in 2019. High insider ownership–because special dividends are an indirect way to reward top execs. The second of our 3 picks, truck maker PACCAR Inc. (PCAR), ticks off all 3 boxes–and it’s dirt cheap, too! PACCAR makes big rigs flying the Peterbilt and Kenworth names on their hood ornaments, and the company’s dividend is just as rugged as its products: PACCAR has paid a regular dividend every year since 1941. But the first-level crowd still shuns PACCAR because it only sports a “regular” dividend yield of 1.6%. That’s too bad, because if you’ve been watching the company, you know this isn’t its real payout. When you add in PACCAR’s last special dividend, its “real” yield jumps to 3.1%–94% higher than most folks think it is! High insider ownership, with 4% of PACCAR’s outstanding shares in the hands of its execs. To be sure, this is a cyclical business, but PACCAR still has a lot of upside as it cashes in on surging US consumer and business spending: profits soared 50% in the second quarter, while revenue spiked 23%, to a record $5.8 billion. Here’s the kicker: Despite those sizzling results, trade worries have pushed the stock down about 2% on the year, giving us a chance to steal this one for just 12 times earnings. But it’s only a matter of time before the herd realizes that the new USMCA deal between the US, Canada and Mexico frees PACCAR from those fears; the company gets 63% of its sales from these 3 countries. Oh, and management typically announces its next special dividend in early December, making now the time to buy. The third pick I have for you is the General American Investors Fund (GAM), a closed-end fund (CEF) I recommended back on August 14. GAM is the classic example of an overlooked special dividend. Right now, its “regular” payout of $0.50 yearly, paid in February, yields just 1.4%. But we need to look closer. When you factor in GAM’s last regular payout and the special dividend, the fund’s trailing-12-month yield jumps to 9.7%! 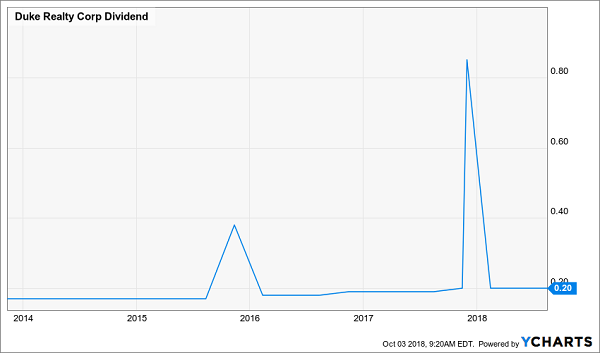 Funny thing is, the so-called “regular” dividend is nothing more than spillover: capital gains or income GAM racks up in the last two months of the year! This may seem like a bizarre dividend policy, but it’s there for a reason: it gives management leeway to invest in fast-growers like Gilead Sciences (GILD), Microsoft (MSFT) and Berkshire Hathaway (BRK.A). The upshot? Thanks in part to this bizarre dividend policy, whose value has been completely missed, GAM trades at a ludicrous 16% discount to its net asset value (NAV, or the value of its underlying portfolio). Let’s buy now, before the first-level crowd takes a second to actually look at the charts. When you combine these 3 special dividend payers with my NEW 8% Monthly Dividend Portfolio, you get something truly magical indeed. Imagine this: you’re banking a safe-and-sound 8% from your investments (either in your golden years or while you’re still working). So if you’ve got a $500k nest egg, that amounts to a steady $40,000–year in and year out! It gets better, though, because the 6 cash-rich buys in my 8% Monthly Dividend portfolio drop their dividends into your account monthly. So you can count on $3,333 every single month on your $500k. You can use that cash however you like: either to pay your bills or plow straight back into your portfolio, growing your income stream further! Next, simply add the 3 investments I told you about above for a nice annual hit of “bonus” cash, just like our lucky PACCAR investors got last January (and are about to receive again just 3 short months from now). And it’s so easy to get started. All you have to do is click here and I’ll give you full details on my 8% Monthly Dividend Portfolio, including these 6 stocks’ names, tickers, buy-under prices and more. The Vanguard High Dividend Yield ETF (VYM) was unchanged in premarket trading Wednesday. Year-to-date, VYM has gained 3.19%, versus a 8.13% rise in the benchmark S&P 500 index during the same period.